Dallas, Texas – Lead Liaison first launched their event lead capture solution, GoCapture!™, in October of 2017. They have rapidly become the global leader in event lead management. Today, they announce the next iteration of their solution, GoExhibit!™, which includes advances in customization, event creation workflow, enterprise-level ROI reporting, registration, check-in, upcoming Windows support, and more. The company, known worldwide for their marketing and sales automation solutions, has been hyper-focused on supporting live marketing events over the last year. They started by answering the need for a better, more efficient way to capture leads. Antiquated badge scanners and arbitrary lead collection apps weren’t giving enterprise businesses everything they needed. 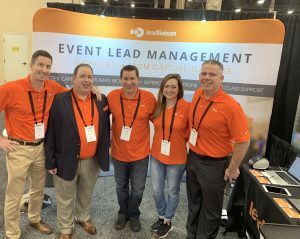 Lead Liaison designed a single solution that manages pre-event communication and preparation, onsite event lead capture, and intelligent post-event follow-up. The updates announced this week further distance GoExhibit!™ from competing solutions. The enhancements allow companies to customize the lead capture experience with brand colors, logos, other custom content such as explainer videos or maps. Furthermore, GoExhibit!™ now provides enterprise-level reporting. The Events Dashboard allows users to track their events and measure ROI. Example data points include average cost per lead (CPL), revenue generated, return on investment, post-event engagement activity, and more. GoExhibit!™ isn’t just for exhibitors. The solution also supports companies running their own events with a customizable check-in and registration system. An integration with Avery, announced last month, allows companies to customize and print badges in real-time, or prior to an event. The GoCapture!™ app is compatible with iOS and Android smartphones and tablets with Windows support right around the corner. GoExhibit!™ integrates with all major CRMs (Salesforce, Microsoft Dynamics, etc. ), marketing automation platforms (HubSpot, Eloqua, Salesforce.com Marketing Cloud, etc. ), analytics solutions (Domo, Revelation™, etc), and lead retrieval providers (Cvent, Experient, etc.). To commemorate the release, Lead Liaison collected a host of resources for businesses interested in implementing this show-stopping solution. The Event Lead Management Kit contains many educational resources, including a detailed presentation of the features GoExhibit!™ has to offer. To learn more about Lead Liaison’s event lead management solution, GoExhibit!™, click here. To download the PDF of this resource, click here. To access our Event Lead Management Kit, which includes this resource, click here. According to Forrester, marketing events such as trade shows and conferences occupy the largest share of B2B marketing budgets at 14%. Choosing the right event lead management solution for lead capture will be the most important decision you make. Before signing a contract, here are 21 important questions to ask your vendor. 1. Does your solution integrate with my CRM, marketing automation platform, and/or analytics platform? What good is capturing lead information if you don’t accurately save the information and prepare it for follow up? Ensure that your event lead capture/management solution integrates with the technology stack you already have in place. If you don’t have the proper solutions in place, like a CRM or a marketing automation platform, ask your Event Lead Management (ELM) vendor if they offer solutions for that need, as well. Communicating with the registered list of attendees prior to the event, and with the qualified leads after the event, is essential to converting your marketing event efforts into closed business. 2. Does your solution allow for immediate follow-up? Insidesales.com conducted a study that found 35-50% of sales go to the vendor that responds first. The amount of time that goes by before you take action on your leads is important. Many event lead management solutions require additional, manual steps to follow up with a lead. Some, however, allow companies to instantly sync leads to your system of record so that you can communicate with the Prospect before they’ve even left the conference. 3. Does your solution allow me to respond to new leads via email, text, postcards, letters, and other types of communications? Make sure you don’t limit the touch points you can send to new leads. According to MarketingProfs.com, 98% of all text messages are opened. Being able to instantly (or even introduce intentional delay) send a text message to new event leads could be vital to your strategy. You might also benefit from sending different types of touchpoints to nurture prospects through their journey. 4. How will you support me? Some vendors in the ELM industry are headquartered in Europe, while some are in North America. Think about where your events will occur and make sure your vendor can support you. What if you have a problem on a Sunday while you’re setting up for your event on Monday? Will your vendor be there to support you? Are they truly a vendor or a partner? 5. Can I import and merge leads into your event object as if I captured them on the lead capture app? You might attend some events where you’re collecting leads at your booth, and at the same time you get a CSV file with leads from a speaking session that occurs in parallel. Make sure your vendor can import your CSV file from the speaking session, and most importantly, merge the data with data you might have already collected at the event to avoid duplicates and keep your data clean. 6. Do you have an API for your event data? Whether now or in the future, you might have a need to pull event data into your custom/third party software. If your vendor provides an API then you’ll be all set for your current/future needs. 7. How accurate are your transcriptions? Why you should ask it: If the event lead management solution you are considering offers “business card transcription” as an option for lead capture, make sure you investigate a little further. You’ll want to double-check how accurate those transcriptions are. 8. How fast is the turnaround time for transcriptions? The faster the transcription can happen, the sooner you can respond to your lead. Quick responses are vital. Your provider should be able to turn your transcriptions around quickly, within minutes, without sacrificing accuracy. 9. Do you offer true ROI metrics and allow me to see how much revenue we generated from an event?? Do you connect with the opportunities in my CRM? Events occupy the largest share of B2B marketing budgets (14%), tracking accurate return on investment is critical. You’ll also need a lot of other key event data to be able to improve your process. Talk to your prospective ELM vendor about the data their solution can report back. Can you track cost per lead? Can you track which sales reps collected the most leads? Can you track post-event engagement? Can you track true ROI percentage, connect to my opportunities in my CRM, and show me revenue figures from my events? 10. Can I customize my lead capture forms? If so, how much? What about creating conditional questions? Being able to customize your lead capture forms is important because the information a business wants to collect on a lead varies from company to company. You should look for an event lead management solution that allows you to customize the information you collect on the lead capture form. To take it a step further, talk to your ELM vendor about customizing the look and feel of the form. A truly enterprise-ready solution will enable you to use your specific company colors, logo, explainer videos, etc. 11. Can I customize the invitations sent out to reps? Can I send an email and text message invitation? Enterprises and large companies have large sales/marketing teams and get lots of email. If invitation emails are standardized, and not clear, you could risk inefficiencies by having your invitation emails deleted or marked as spam by recipients. Your vendor should help you custom your invitations. Also make sure you can send email, text, or both at once, so your invites are successfully received. 12. Do my reps have to log out and log back in to see changes? Attending an event is stressful. The last thing reps need to deal with is logging out, tracking passwords, etc. to see changes/updates that might be pushed out to the mobile device. Make sure your vendor can push out updates in real-time without requiring people to log out and then back in again. 13. What if my team onsite at the event calls me at the office, explaining that they need to make a change to the event form? Can I make last-minute changes? No matter how much you prepare for your event, there is a good chance you’ll need to make some last-minute adjustments as the team onsite adjusts to the environment and the audience. Look for an event lead management solution that supports instant updates. You want to be able to make changes to your event form in real time to best support your event staff. 14. Do you have offline mode? Internet at trade shows and conferences can be spotty and expensive. You want to make sure that the solution you choose will support offline lead capture so you don’t lose a single opportunity. 15. Can I run my own events with the same platform? If your company hosts its own marketing events, or even if you think it might be a possibility one day, ask your ELM vendor about running your own events. The solution you commit to should offer the option to run event check-in and registration. Bonus points if it supports the ability to print badges based on your registered attendee list. 16. Can you scan NFC badges? Over time barcodes and QR codes on badges will be obsolete. The code consumes real estate on the badge. The modern way to create a badge is to embed a NFC chip into the badge (think Apple Pay) and hold a NFC-enabled device up to the badge to collect lead info. If your vendor doesn’t support NFC badge scanning then they’re not ready for the future and might not be ready to support you down the road. 17. What does your solution offer, on the back end, to enrich lead data and ensure that everything is up-to-date post event? Let’s say that your team has a great conversation with an interested buyer. Your team collects their business card to follow up. But, wait! This person’s business cards was printed over a year ago and their phone number has since changed. Look for an ELM service that will enrich data. A superior solution will add key lead data such as gender, age, social presence, affinities/interests, social profile URLs, and much more. 18. Can you help me qualify my leads? Do you provide lead scoring and grading? Lead qualification will help you differentiate look-alike leads and keep your sales team focused on important leads. Scoring helps measure how engaged a lead is, and grading measures how well they match your ideal buyer criteria. 19. Can you help me distribute my leads and report back to me on which reps are missing any response time requirements we put in place? You might need to distribute leads based on various criteria, such as geography, names accounts, job titles, and more. You might also be interested in adding SLAs and report back to management for any reps that don’t follow up with your leads in time. Make sure your vendor can support your lead distribution and SLA needs, whether you have them now or are planning for them in the future. 20. If I have a list of registrants, can you help me market to them and/or load them into the app to search for them at my event? Some providers have communication platforms that can help you reach out to a list of registrants prior to the show and build rich profiles at the same time. If you have registrants, you might also want to search for them on the lead capture app, select them, and pre-fill the form with their information. Make sure your vendor can help you make the most out of your registration lists. 21. Can you track the entire lifecycle of a lead, before and after an event? Your engagement with a prospect may not start, and hopefully doesn’t stop, at your event. Look for an event lead management solution that can keep all engagement (inbound/outbound) in a timeline in addition to what info was collected when the lead was captured at an event. Examples of that activity are website visits, email link clicks or content downloads. To set up an appointment to ask our team these questions, click here. Social media may have transformed the way that brands and customers engage with one another, but trade shows persist as a cornerstone of face-to-face marketing. And precisely because so much brand interaction has been digitalized, the potential for trade shows to create a meaningful and memorable brand experience has only become greater. One of the greatest benefits of participating in trade shows is that attendees, simply by virtue of deciding to be there, are incredibly receptive to your message. A striking design is arguably the most important factor when it comes to attracting these open-minded, warm leads into your booth. But standing out in a crowd of competitors is no easy task. While more traditional, tried-and-true booth design schemes that consist of a graphic backdrop, spandex table covers, and a few banner stands may be the best option for traditionally conservative industries, the trends in trade show booth design have in recent years taken a turn for the stunning and creative. Trade show attendees are increasingly expecting more from the exhibits they visit, and a well-designed booth space plays a decisive role in all of these expectations. Effective trade show booth design ideas serve to do a lot more than just look good. They are the backdrop against which an entire brand experience can unfold. From the first encounter, to interacting with your staff, to leaving your booth with a goodie bag, your trade show booth design can either enhance or detract from a visitor’s experience every step of the way. Engineering your exhibit to be both attractive and functional, both unique and on-brand, may be the single most important project you undertake to make your brand’s next trade show appearance worthwhile. Joseph Robison is the Marketing Manager at Coastal Creative, a large format printing company based in San Diego that specializes in designing stunning trade show booths and branded spaces. He is also the founder of Green Flag Digital, an SEO and digital marketing consultancy. When your company needs to generate leads, your goals should be to find creative methods that allow you to communicate and network better with other businesses as well as untapped customers and, simultaneously, establish yourself and your company as an authority figure. You need to cut through the noise and get in front of people. When you show up, you need to be remarkable so that people see you as an expert and want to work with you. Here is a look at five ways to generate leads by getting in front of your prospects, where they are. Slack channels are tight-knit communities and, typically, you need an invitation to join them. However, once you get access to a channel, you can begin one-to-one communication with channel members or send broadcast messages to everyone. Slack channels are usually active, so you’re able to get in front of people passionate about a specific topic. By joining Slack channels, you can grow your brand within that community, and then help the other people in exchange. By helping others consistently, you can grow your status and authority within the group. Remember to bring value always and don’t spam. Guest blogging is an effective way to improve your company’s reach. Websites require content to attract new visitors and nurture their existing audience. When you provide blog posts for other sites, you gain exposure, and they benefit as well because they get to publish great content. Guest blogging positions you as an authority figure because a website is endorsing your work by publishing it. Guest blogging also helps you build backlinks, enhance your search placement and drive relevant traffic to your site. Quora is a wonderful way for you to answer important questions relevant to your industry and build your credibility. Make no mistake that answering Quora questions has a similar effect to that of guest blogging. Quora is an adult version of Yahoo Answers where people are actively asking for help and looking for specific answers. At the time of this writing, the website recently reached 100 million monthly unique visitors. Quora allows people to answer questions and establish themselves as an authority figure. Answer questions that come from members of your community and industry. Doing so will help you target users who fit the profile of your ideal customer. When you use this website, you can create a company profile and then answer the questions that are related not just to your company but your industry as well. You can handle reputation management by searching for questions that people are asking related to whatever service or products you provide and then answer those questions. You can even set it up so that each member of your team creates a unique profile and team members can answer questions in conjunction with one another based on different levels of expertise. Syndicating your content gets more mileage out of a regular blog. There are so many online platforms that have many visitors, and they often need quality content. Blogs, community websites, social media sites, forums and question-and-answer sites are an ideal solution. Syndicating content is a terrific way to enhance your lead generation because it amplifies the reach of your content, allowing you to tap into an audience you might not have otherwise been able to access. All of this optimizes your returns and puts your content in front of a demographic with a high potential for sales. You aren’t just restricted to publishing your content to your immediate audience of current customers. When you put effort into making high-quality content, you should be rewarded by expanding your reach, so prospects get to see what it is you offer. Sharing your content through syndication also improves search engine ranking with enhanced credibility and relevant backlinks. This puts you in a place of authority as a leader in your industry, which generates more traffic and potentially more qualified leads. With content syndication, you can collaborate with another company to co-market your promotional efforts where you both promote a single piece of content. You can also swap content with another brand where you both agree to promote one another’s content on your respective social media channels. Public speaking is a superb way to gain a captive audience. In today’s world, as things become increasingly more internet-based, people are trusting the face-to-face selling method much more. Known as the podium effect, being a public speaker will position you as an expert in the industry, which is what each of these methods helps to do. Focus when you start at small, intimate events. This will help you figure out what your audience wants to hear and help you fine-tune your selling methods. The right strategy is important in setting your business up. You can begin at small events with just 10 people at a time put on personal company events where you make an offer at the end for your attendees. When you start out, you want to create your own events so you can craft your signature talk and gain experience with your audience. Libraries or community centers make ideal places for these local events. You can book area venues and market it to local residents. Once you become more comfortable with it, you can host bigger events. Just remember that, at the end of each public speaking event, you need to give your attendees something like a free consultation or the opportunity to try a product for free. Give them an offer they can’t refuse. On the topic of syndication, if you know other people are having events, and they are looking for speakers like at expositions, conferences or trade shows, offer yourself as a speaker. Even if it’s just a few minutes, this could be a low-cost opportunity with a lot of return. Overall, the purpose for each of these five creative methods is to allow you a way to generate leads by establishing yourself as an authority figure. You want to expand your reach and make sure that people see you as a leader in your industry — someone they can trust to whom they can turn for answers. To learn how to properly manage those leads, once you have them, contact us here. Morgan Williams is a Sales Professional and B2B Lead Gen Consultant based in Chicago, IL For a case study on how to use automated cold email marketing to spend $166.70 and make $3,435.30 in profit (2,061% ROI – email templates included), head over to his blog. Want the executive summary? Download the infographic here. Business is changing at the speed of light. As marketers, it seems like every time we feel like we’ve mastered a new strategy, a new one emerges. Advances in modern technology drive marketing organizations at a fast pace. But, just because more and more people are adopting new technology, it doesn’t mean that one-to-one contact is gone. In fact, most of the technology that we create is intended to give businesses the opportunity to automate administrative tasks to make room for more person-to-person contact. Marketing events are a great way to engage in one-to-one contact. Multi-day conferences, trade shows, conventions, seminars, thought-leadership workshops…these are all great examples of event marketing. They give businesses the chance to interact with consumers who are already 10 steps closer to purchasing, just by the simple fact that they are at the event in the first place. Perhaps you are trying to decide if your business should invest in event marketing. Maybe you have already started exhibiting at events and you just want to learn more about them. Or perhaps you are a seasoned exhibitor who’s just looking for a few good stats. Either way, you are in luck! We have rounded up 40 important statistics that help shed light on event marketing for business-to-business (B2B) companies. Why do Companies Invest in Event Marketing? Businesses around the world are investing in marketing events. Here’s how those strategies are affecting budgets and goals. Managing the leads from your event is only part of a robust event lead management strategy. An event lead management solution should not only assist you in capturing your lead, but also in properly managing the data, enabling you to follow up quickly, and helping you track ROI. You get the picture, right? Event marketing holds a significant position in the future of growing businesses. It’s never too early to start mapping out your strategy – whether you are a seasoned event marketer, or you plan on trying it out for the first time. Below is an infographic that summarizes all of these important stats. And, to learn more about our enterprise-level Event Lead Management solution, click here. Looking for creative strategies to use at your next trade show or marketing event? Look no further! We’ve gathered lots of ideas that can help you before, during, and after an event. Planning for an event is the most important part of your process. If you don’t get the right tools in place, you’re bound to make mistakes. Do your research and see what your biggest competitors’ booths look like. Track competitors in your CRM so that you know if any competitors stopped by your booth. Invest in a great display, so that prospects will want to invest in you. If your display looks pathetic, so will your company. Send 1:1 emails and offline marketing pieces, such as direct mail, ahead of time offering people a chance to schedule a meeting at your booth. Send a marketing email (or a series of emails) announcing your presence at the event and what you’ll be showcasing. Offer educational content in these emails to establish yourself as a thought leader at the event. Send a reminder email (or text, if possible) to stop by your booth. Engage with conference attendees prior to the event – ask for attendees to vote on what swag they’d like best. This is a great excuse to reach out to attendees and an easy way to get them to engage. Lists of registered attendees can usually be found by contacting the event manager. Speaking of swag, reconsider your definition of swag. A few ideas are: headphones, socks, or a free t-shirt with a offer for a free beer if they are seen wearing it to networking parties after the convention. Post to all of your social media accounts. Choose a different image or message for each platform to keep readers’ attentions and reduce redundancy. Consider how you’re going to capture leads at the event (badge scan, business card transcription, upload registrants, manual form fill, etc.). Some event lead management solutions offer all of these! Do all of these things in your marketing automation platform to track key engagement prior to the event. Find one that does it all. You already believe in your product or solution. Now, it’s time to show off! Make sure you’re the star of the show. Keep your display clutter-free. Don’t distract visitors. Clean lines and a simple, sleek design allows your message (and the experience) to play center role. Host a wireless charging station at your booth with a fun activity, or snack, for people waiting. Place devices in front of your booth and run them as a kiosk for leads to self-service (watch videos, submit an inquiry to learn more). Evaluate & measure ROI. This is key to growth and future success. Evaluate your process. What worked? What didn’t? Did your team run into any issues? Did your technology support your properly? Measure ROI of your event using Cost Per Prospect (CPP), Revenue Generated, and overall ROI metrics. Some event lead management solutions offer an Events Dashboard to compile and report these key metrics, which makes things really easy. Hopefully you picked up some great tips today. We’ve included this infographic below for you to download and/or share with your colleagues. And, if you’re interested in our home-grown event lead management solution, request a free demo here. Marketing events can be a very costly effort. There’s the booth rental, the booth design/display, travel and expenses for your employees working the booth. Service costs like electricity, cleaning, or wifi can sneak up on you. Badge scanners are expensive (have you looked into other options?). I think you get my drift: marketing events cost a lot of money. Return on investment (ROI) is paramount. Once your team has captured hot leads at an event, you should be prepared to follow up with those leads quickly and effectively. There’s no time to waste – don’t let your competitors beat you to the punch. We are often asked for examples of how a business can (and should) nurture leads post-event. 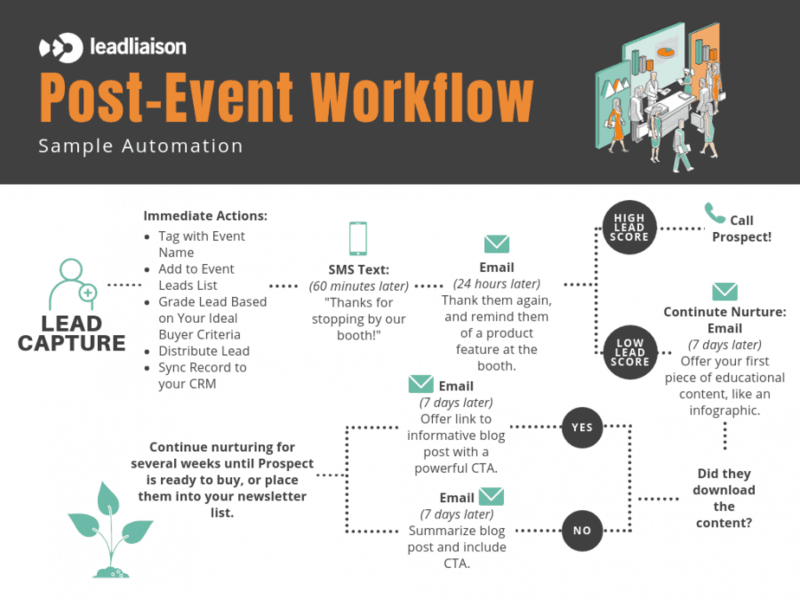 Below is an infographic that examines a tried-and-true post-event lead nurturing strategy. The first step in determining your post-event lead nurturing strategy is to make sure you have the technology in place to automate it. Don’t count on these things being done manually – it’s just not realistic. Companies are busier than ever these days, usually with multiple people wearing multiple hats – stretched thin. There’s also tons of room for distraction at (and after) marketing events. The more administrative tasks you can automate, the better. Let your employees spend their time building relationships and making connections. There are lots of options out there, but we recommend a wholistic approach. Look for technology that works together, so you don’t have to spend time exporting and importing. For example, our event lead management solution allows businesses to create and customize lead capture forms, prepare intelligent post-event workflows, quickly capture leads onsite, instantly sync with a CRM, and then place them into those previously mentioned workflows. No additional technology is needed. Of course, we love our solutions. But, there are lots of options out there! Just make sure you have something in place to be able to effectively execute your plan. Let’s talk more about lead score versus lead grade. You may want your reps to call a Prospect if their score is high and their grade is high. Or maybe just one or the other. To make that determiniation, you should know the differences. Lead scoring is a way to measure engagement, and it happens over time. Even before your event, a Prospect may have already been to your website, scanning a few of your webpages, which would increase their score. It will continue to increase as they continue to interact with your website or your content. On the other hand, grading is a way to measure how well a Prospect matches your ideal buyer criteria. Your reps can qualify and assign a grade onsite at the event. With our event lead management solution, reps can collect lead data quickly and either grade them in the moment, or they can go back later and grade them when they have a lull in booth traffic. Once those organizational actions have been completed (usually within seconds), what do you want to do next? Let me answer that for you…you want to follow up. Insidesales.com conducted a study that found 35-50% of sales go to the vendor that responds first. That means that the timing of your follow up matters. If at all possible, reach out to your leads within an hour of them visiting your booth. A great example of this kind of outreach is with a text message. If you’re capturing a lead’s mobile phone number, use your marketing automation platform to send a text message saying, “Hi Jane, it’s Bob. Thanks for stopping by our booth! We’ll be in touch soon – but in the meantime, here’s my number if you have any questions…” That is sure to make your company stand out. Send an email. Even though you already sent a text message, send an email 24 hours later. Give your Prospect time to filter through messages from other booths, but not enough time that they forget who you are. Remind them of a product feature that sets you apart from other exhibitors at the trade show. At this point in the game, you may want to consider customizing your lead nurturing strategy based on the previously mentioned lead score and/or grade (depending on what matter most to your business) and how the Prospect interacts with your outreach or content. Your marketing automation platform should have the capability of customizing the workflow using this kind of criteria. If the lead score is high, assign a task to a rep to make a call. If it’s low, continue to nurture via email. Don’t disqualify leads with a lower score or grade. They may be hesitant because they are taking this decision more seriously. Offer a piece of educational content, like an infographic or a case study. Try to be their source of education in the industry, so they begin to see your company as a thought leader. If they download the content, you may want to pivot further based on that. If they downloaded it, offer another link to an informative blog post with a powerful call-to-action (CTA). Make the decision to reach out to you easy. If they didn’t download the content, perhaps they need the same information as the lead above, but rather they need it summarized within the email itself to reduce effort. Include your CTA within the email itself, to make it even easier. Continue nurturing your Prospects for several weeks until they are ready to buy, or place them into your newsletter list so that you can continue your educational content without being too pushy. It’s all about creating a sense of authority and innovation within your industry. Those that actively attend trade shows, conferences, or other marketing events are not passive. They are engaged, and their presence at an event will make them hyper-aware of you and your competitors. If you decide to exhibit at an event, be prepared to make it count. Here’s an infographic that you can save for when the time comes. And, good luck! Let’s face it: generating leads at trade shows isn’t as easy as it once was. Vibrant booth displays and creative signage may catch the eye of trade show attendees, but this alone won’t result in new leads for your business. We’ve rounded up a few interactive lead generation ideas that you can use to maximize the success of your next trade show. To draw in high-quality attendees and get their information, you need to make sure they are engaged with your booth. One of the trendiest ways to boost engagement at your trade show booth is to create interactive experiences for your visitors. Interactive experiences are highly effective for lead generation because they allow visitors to learn about your product or brand in an engaging way. And if you’re thinking that this will no doubt be expensive to execute, don’t worry — interactive lead generation exercises can be created on any size budget. Make learning about your industry more engaging with a fun trivia game. Half the fun of trivia is winning, so you’ll want to have some cool prizes and giveaways. Although everyone should leave your booth feeling like a winner, be sure to reward the actual winners with something of higher value than what you give everyone else. If you’re marketing to millennials and the generations after them, digital games are a wise investment. Digital games provide a fun experience for attendees and can help you drive qualified leads — if you use them correctly. Before visitors play your games, collect their contact information with some sort of lead capture app. Many exhibitors neglect the importance of this step and wind up with everyone playing their games for nothing in return. Be sure to have an event lead management plan in place, so that once you capture your leads you’ll actually be able to do something with them (at least send a “Thank you for stopping by!” text/email). As cool as technology can be, who doesn’t love a good spinning wheel? These flashy, colorful wheels may not be original, but they are extremely effective at grabbing the attention of passersby. If you use a spin wheel at your next event, be sure to have quality prizes. Cool tech giveaways are always a winner with audiences, they fit into any promotional budget and they’re guaranteed to be held onto long after the event is over. Virtual reality (VR) and augmented reality (AR) may not be new, but both technologies are novel enough that they are guaranteed to captivate your audience and drive traffic to your booth. In fact, don’t be surprised if people form a line! Best of all, VR and AR are surprisingly cost-effective lead generation strategies. It can take some technical know-how to get them up and going, but virtual reality headsets with your logo on them are extremely appealing. Visitors will be so eager to try your AR and VR that getting their information will be easy. Ask them for it during the setup process. Allowing visitors to test your product is both a fun experience for them and an effective way to turn a casual visitor into a potential customer. By removing some of the anxiety from the purchasing process, you’re already one step closer to converting your lead. Renting a photo booth for your trade show is far easier now than it was just a few years ago. Today, branded photo booths are sleeker and easier to set up than their bulky forebears. Best of all, they can benefit your brand in so many ways. Not only can they increase engagement, but modern photo booths can easily be customized to promote your brand’s message and collect consumer data. To capture visitor information, simply give visitors the option of entering their email to receive their photo digitally. Then they can share their photo on social media and provide your brand with even more exposure. Touch screen displays are now a common sight on the trade show floor. But today, the content we use in these displays is far more engaging. Interactive content such as quizzes, games, product demonstrations, digital product catalogs and videos can spark engagement among visitors and easily double as a lead generation tool. In addition to being a great lead capturing tool, interactive content is a great conversation starter. Everyone will want to share their quiz results or the score they received on one of your games. After spending months planning and budgeting for your trade show, you no doubt want something to show for all your hard work. Offering interactive experiences to your booth visitors will give you the edge you need over the competition and drive qualified leads for your business. And, if you’re looking for an event lead management solution be sure to check out Lead Liaison’s GoCapture! app (which includes an onsite lead capture app AND “back office” capabilities to make it easier to take action ASAP!). Author’s Bio: Kelsey Stage is the VP of Business Development at PROMOrx. She enjoys sharing marketing and branding tips through blogging and local meet-ups. Outside the office, you can find her at the yoga studio and playing with her dog, Luna.